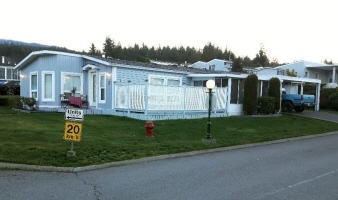 2 Bedroom/2 Bath plus Den Mobile Home located on a large level lot in Rock Creek Mobile Home Park. Ideally situated across from a landscaped pond and offers a double carport. This well-appointed trailer boasts a spacious light filled open concept living space with new laminate flooring, countertops and appliances. Built-in cabinetry in the dinning room offers additional storage and Livingroom is warmed by a lovely gas fireplace. Master Bedroom provides a 2-piece ensuite, and Master Bathroom boasts a jetted tub. 19x10 sunroom creates a sunny space perfect for enjoying your morning. All information should be verified if fundamental to purchase.